Is this three-deck, zero-emissions super jumbo plane the future of flight? Nasa has trialled the first of the planned green aviation technologies on Boeing's ecoDemonstrator 757, to reduce fuel consumption and emissions. Named the active flow control enhanced vertical tail flight experiment, the test evaluated the impact of sweeping jet actuators on the tail and rudder surfaces aerodynamics. For the test, 31 jet actuators were installed on the aircraft's vertical tail, to provide stability and directional control during take-off and landing. Nasa Langley Research Center flight tests lead systems engineer Mike Alexander said: "If we can control the flow of air over the vertical tail on demand, we believe we can provide enough side force during take-off and landing that aircraft manufacturers can safely make the tail smaller. "The ability to reduce the size of the vertical tail would reduce weight and drag and decrease fuel consumption and emissions." Earlier this month, the ecoDemonstrator made six roundtrip flights between Boeing Field in Seattle and the Strait of Juan de Fuca, as part of the trial. During the flights, the active flow control technology was subjected to various configurations and flight conditions, including simulated engine failures. Langley Research Center active flow control experiment principal investigator John Lin said: "Initial flight test results seem to validate the wind tunnel testing we did with a Boeing 757 tail that was outfitted with this same active flow control system. But we still have a lot more analysis to do." Wind tunnel tests carried out in 2013 showed that future aircraft will be able to reduce the size of vertical tail by around 17%, contributing to fuel efficiency by as much as 0.5%. In the coming days, Nasa researchers will test wing coatings on the ecoDemonstrator 757 in Shreveport, Louisiana, US. Five different coatings will be applied to edge slats of the aircraft wings, to test if they could prevent bug residue on the wings during flight. The aircraft is planned to complete 15 days of flying around the Shreveport area between 27 April and 15 May. The active flow control and wing coating experiments are part of Nasa's aim to develop environmentally responsible aviation technologies to reduce aircraft fuel consumption, noise and emissions. Boeing started ecoDemonstrator 757 flights in March this year, to evaluate new technologies for commercial aviation segment. Aero Electric Aircraft Corp. (AEAC) selected Avidyne (Booth C-071/072 and N-026) to collaborate on the development of the avionics panel for the next-generation "Sun Flyer" solar-electric training aircraft being developed by AEAC, the companies announced on April 21 at the Sun 'n' Fun International Fly-In and Expo in Lakeland, Fla.
"The Sun Flyer represents a breakthrough in aviation technology and we are certainly happy to be participating in the development of the avionics and instrumentation for this innovative new trainer," said Avidyne CEO Dan Schwinn. Led by CEO George Bye, AEAC plans to offer the first certified all-electric airplane for the aviation training market. In late January, the company started flying a single-seat technology demonstrator for its next-generation solar-electric training aircraft, and it continues to perform initial R&D flight-test operations while the first two-seat prototype Sun Flyer is being assembled. AEAC expects to fly the prototype later this year and hopes to obtain FAA certification by the end of 2017. "Avidyne is at the forefront in avionics technology and we look forward to working closely with them on this program," said Bye. "Their low-power, high-fidelity touchscreen displays produce high-definition colors and graphics that are ideally aligned with our next-generation electric propulsion technology." AEAC is also licensing technology from PC-Aero and collaborating with Redbird Flight Simulations to offer a comprehensive pilot training system. WEST LAFAYETTE, Ind. (AP) - Purdue University has unveiled plans to establish an aerospace technology park that will allow it to partner with private companies to research and design new technology. Purdue officials who announced the new park Tuesday in Indianapolis say it will provide "unprecedented opportunities" for Purdue, its students and the community. The Journal & Courier reports (http://on.jconline.com/1QfTaAo ) the aerospace park is the university's latest partnership with industry leaders. Purdue announced in February that it had formed a research consortium with Boeing and Rolls-Royce to develop thermal-management systems. The university's Department of Aviation Technology has partnered with Republic Airways to launch a program matching Purdue students with Republic's career track. College of Engineering Dean Leah Jamieson says the new park will help Purdue recruit and retain top faculty and students. With the Apple Watch at the front of the tech industry's mind, the passenger experience industry is also thinking hard about wearables - and how they could revolutionise the way airlines operate and deliver services to passengers. RGN last week sat down with SITA OnAir's CEO Ian Dawkins and chief strategy and marketing officer Fran�ois Rodriguez on the sidelines of the Passenger Experience Conference prior to the Aircraft Interiors Expo in Hamburg, Germany. Wearables will first change the way the flight deck and the cabin communicate, says Rodriguez, who is currently the company's lead on wearables within the cabin. No longer will flight attendants need to pick up a wired telephone to speak with the cockpit, with wrist-to-flight-deck talking the way forward. Work is already ongoing to figure out how to link the bleeding edge of wearable technology with highly regulated aircraft communications, with Rodriguez suggesting the primary way of linking into backend systems being through the tablets that airlines are already issuing to cabin crew. Using tablets will, of course, require some custom application development if the Apple Watch is used, since the fruity wearable requires an iPhone for functionality. A second implementation of wearables will be passenger experience notifications. As an example, the "seat 2J would like a tomato juice" notification possible with current generations of IFE is limited to seat-to-galley notifications. SITA OnAir expects that notifications could be routed to a flight attendant by a simple tap on the wrist from a smartwatch. Expanding analytically on the options available, it would be very interesting to see an airline using wearables to dynamically allocating flight attendants to greater demand across cabins, prioritising requests from premium cabins, or flagging requests from high value customers holding high-tier status. Thinking of safety, it would also enable backend checks of, say, alcohol consumption: a flight attendant could be notified to conduct a surreptitious alcohol check on a passenger, and might also deliver a bottle of water or a bite to eat alongside a slightly smaller pour or a mixer-heavy, booze-light drink. SITA OnAir's Rodriguez has firm views on the wearables platform too. Initially, airlines rolled out iPad-based systems, since Apple's iOS is widely familiar to the greatest number of potential users. With the evolution of Microsoft's Surface platform, the enterprise IT benefits of integrating Surface tablets with wider airline systems are driving a new generation of product rollouts. Rodriguez identifies the openness of the Android platform as a significant drawback to its implementation in the aircraft environment. With numerous airlines already issuing connected (and ruggedised) touchscreen devices to their maintenance teams, and Japan Airlines developing a Google Glass-based maintenance system with the Nomura Research Institute, it's clear that the airline wearables revolution is just getting started. More widely, SITA CEO Ian Dawkins highlighted four key benefits already being delivered by its connected aircraft strategy, which would tie in neatly to the wearables agenda: flight deck communications, passenger broadband, aircraft tracking, and aircraft health monitoring. SITA OnAir also confirmed RGN's prior exclusive that Malaysia Airlines is trialling its tracking system, in addition to Singapore Airlines. A formal launch of the so-called AIRCOM Flight Tracker is planned for mid this year, says an OnAir spokeswoman. Since SITA OnAir already manages highly secured data in the cockpit, and has adopted a "nose to tail" approach to connecting the cabin and driving operational benefits for airlines, it believes it is positioned to help fortify operators to fight cyber crime. "Today you've got, around the world, people cutting heads off other people; in the future, hacking an aircraft from the ground will be the thing," predicts Rodriquez. The fear is real. A security researcher was recently denied travel on United Airlines after suggesting on social media that the carrier's onboard systems can be hacked, reports AP. He's one of many hackers to have made the claim. And the FAA acknowledges it must do more. Citing the potential for security threats to transpire that "could result in the malicious use of networks, and loss or corruption of data brought about by software worms, viruses, or other malicious entities" the agency is in the process of establishing an aircraft cyber security working group. (CNN)Designer and aviation enthusiast Oscar Vinals is slightly addicted to crafting concept planes. Last year, he came up with the design for the AWWA Sky Whale, a futuristic aircraft that he said would revolutionize green air travel and carry an astonishing 755 passengers. Now, he's bested himself. With his newest design, the AWWA-QG Progress Eagle, he imagines the future of travel as a triple-decker aircraft with zero carbon emissions. Rather than relying on traditional fossil fuels, the plane (which he envisions taking to the skies in 2030) would rely on six hydrogen engines to lift the plane off the ground. The aircraft would also be fitted with a rear engine that would double as a wind turbine, and solar panels on the roof and wings. "The best aspect of the Progress Eagle would be its capacity to generate its own energy," says Vinals. He adds that the flight would also be "noiseless." Vinals also envisions the plane, which would carry up to 800 passengers (275 more passengers than the largest aircraft today could handle), would have a new passenger class in the front of the plane. The "pilot class" would have panoramic views. There would even be the potential for private rooms, shops and restaurants. "Twelve hours in an airplane could feel more like a select hotel," says Vials. "It would reduce the stress of a long flight." At the moment, the concept is little more than, well, a concept. Vinals acknowledges that the technology needed to implement his design is still a ways off. "Today we have about 40% of the technology needed to build it," he admits. "Quantum solar cells, nanowires to kinetic power, micro radio wave harvesters -- these technologies only exist in a limited scale at the best laboratories around the world. But in a few years, we could overcome our limits and build anything imaginable." 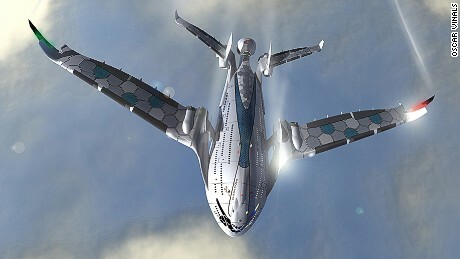 Designer and aviation enthusiast Oscar Vinals has designed a triple-decker concept plane called the AWWA Progress Eagle, which he imagines could be implemented by 2030.